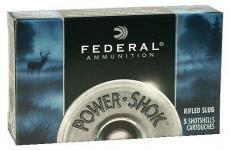 This line offers you a full complement of rifled slugs for just about every shotgun gauge. If you shoot with a 410, 20, 16, 12 or 10-guage, you'll find a slug for your smooth bore here. Remember, rifled slug means the slug is rifled , not your barrel. 12 Gauge, Rifled Slug, 2.75"
16 Gauge, Rifled Slug, 2.75"
20 Gauge, Rifled Slug, 2.75"
12 Gauge, Rifled Slug, 3"
10 Gauge, Rifled Slug, 3.5"